Yield in C# , can use with the return statement to build a collection of returns. For example , I have a method that we need to return a collection of integers in a lazy manner and expose it through an IEnumerable interface. Based on the value produce with the yield return , consumer can write some logic based on their need. 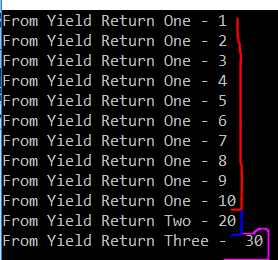 In the below example you can see I have a method ReturnSomeIntegers() , which return 1 to 10 by iterate using for loop with yield keyword and also two more yield return with 20 and 30 respectively. Whenever ReturnSomeIntegers() method return a single value , the execution will switchback to YieldDemo() for each method and print the value based on the condition.